I’ve strayed. I thought I had learned my lesson in grade school when I picked up a cool Tente space truck. Or maybe in middle school when I got some Tyco Super Blocks as a present. I certainly “knew” that the clone bricks just aren’t worth it—sure, you might get some cool shapes you can’t find in Lego, but at what cost? 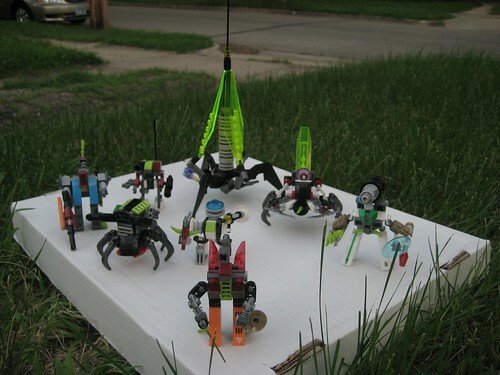 I’d keep seeing these Mega Bloks Halo sets, with their many different curves and gorgeous shimmery purples. And there was that big puzzle-piece dome. Of course I knew I shouldn’t. But Nnenn did. And then I saw this Silent Running-esque ship using the Mega Bloks domes. And Jang (of Jangbricks) started buying and reviewing Mega Bloks sets. And I started looking a little too closely when I was in the store. I’d pick a box up, turn it over and check out its pieces. Look at the little window where you could see some actual pieces shimmering. And then one day I thought “well, it can’t hurt to look”, and checked a price. Just a quickie, here. Caitlin wanted to use my Legos for a knitting project, and needed some guidance on what colors existed and what to call them in order to buy more. So I put together a plate with examples of most of the colors I have. She suggested that I take a photo for reference, which is an excellent idea, because I sometimes have to do some digging and comparing to figure out the more obscure colors myself. I don’t usually participate in any of the Lego group builds/theme builds for a number of reasons. A lot of them don’t call to me, and the ones that do tend to be the more involved ones, and I just don’t have the time. But this year Nnovvember rolled around, and an idea struck me: I’d been wanting to do something in the style of the Galaxy Squad bug ships but hadn’t figured out what. I was thinking a beetle, but that doesn’t fit the requirements of a Vic Viper—then it hit me: stag beetle! It has the two forward spars. And I can use the wings and shell for the Vic Viper’s requisite structures! About a month ago, I had just disassembled the first line of Galaxy Squad sets and wanted to force myself to build something from just their parts–the constraint helps me work on my creativity. I haven’t been happy with the polish or problem-solving of my building of late, which is probably due to not much building in the last 5+ years, and not a whole lot more than that in the previous decade. Anyway, I was trying to decide what to do, and that’s when Mobile Frame Zero arrived. Perfect synergy! So, I set out to build a Galaxy Squad-themed Mechaton (er, sorry, MF0) squad. It was a fun exercise, with mixed results. A couple months ago, I rediscovered some of the updated versions of classic Space Lego sets, and got to wondering about Blacktron, absolutely my favorite Lego theme as a kid. I did some digging around and found that a lot of people had done updates for Blacktron II sets, there were a couple different runs at “Blacktron III”, and a fair number of people doing new ships in the colors of Blacktron. But mostly people were focusing on the Blacktron II theme, using either its colors or cockpit style, and while I love those cockpits, I’ve never cared for the color scheme or actual sets in that line.